The Tokyo (JP) facility service the growing Asia Pacific demand for low-latency cloud services, and joins the growing number of options for your Website and Hosting service deployments. We choose the locations of our data centers in large part based on where we can most improve network performance. Japan has been one of the problematic regions for network providers. 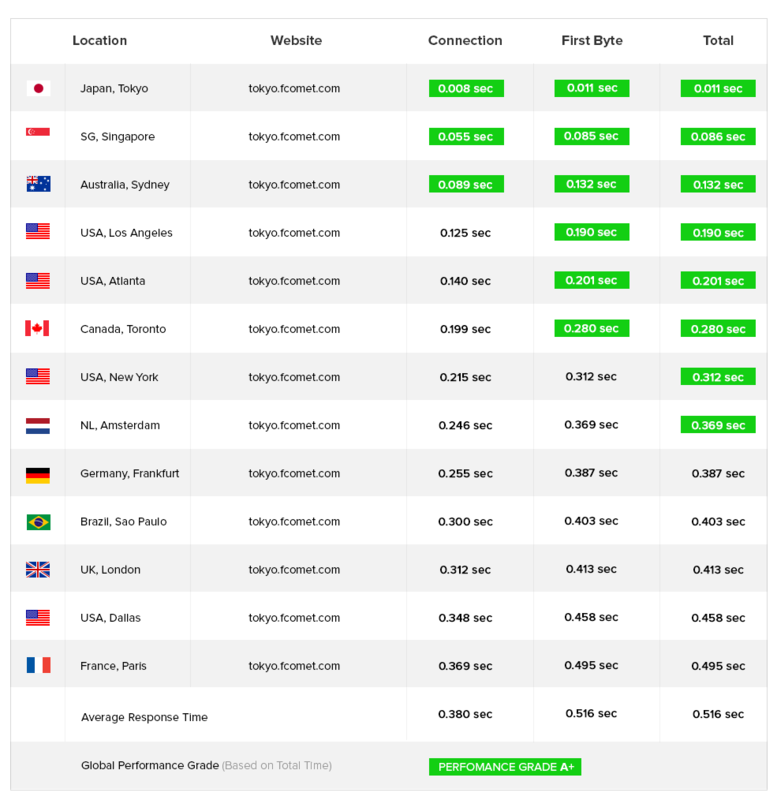 Traffic from Japan usually experience higher latency to our US and EU-based hosting infrastructure, leaving our clients with only a single option - Singapore. With our new Tokyo facility, ping times from Japan, South Korea, Taiwan as well as China are now averaging under 40 milliseconds. What do Our Datacenters offer? Power redundancy, solid security and geographical proximity for your projects around the world! Enterprise-level access control, constant monitoring and complex network of security systems. We take it seriously! Biometric access systems, CCTV monitoring with 100% coverage, layered security clearance and more. All unauthorized access from the outside world is literally impossible. Redundant power supply is of major importantance for a datacenter. We utilize N+2 power redundancy on all levels to ensure 100% uptime for all our datacenters. Capacity of 150+ Gbps and 10+ Gbps between network layers. Fully scalable and reliable solution for your websites! Our datacenters are scalable and allow communication between complex systems and private server rings for load balancing, redundancy and storage area networks. It is easier to talk about a service and how good it is. However, we maintain world-class certification to prove it's quality! We maintain high standards for our infrastructure and personnel. Our datacenters are SAS 70 Type 1 and 2, as well as SSAE 16 certified for a solid protection of all facilities. Complex infrastructure and strategic datacenter locations around the world. Our clients can choose from a wide range of enterprise-level datacenters for better speed. A datacenter closer to your visitors will result in better loading time of your website. Do not compromise with speed and choose carefully. Our datacenters are based on three different continents. This helps you find a location next to you and your visitors, which results in better loading time of your websites. Our infrastructure is protected by different enterprise-class security layers. This includes multi-level clearance, biometric access control, 100% CCTV coverage, 24/7/365 trained guards and more. Biometric Access ControlSolid security on all facilities we manage. We use the latest technology to make sure that all unauthorized access is simply impossible. Chillers & Water StorageModern cooling systems in our datacenter in Texas. A constant and adequate heat management for the entire infrastructure. UPS SystemsA side-view of our UPS modular system in Chicago, Illinois. We are using a transformerless online UPS design for best results, power efficiency and lower pricing. Backup GeneratorsView of the power generators in our London facility. It can run flawlessly for several weeks if there is a long term power grid failure. WiringClose view of the redundant network cabling for one of the modular units in our Singapore datacenter. Racks Side ViewA side-view of the racks in a single modular unit. Location - Dallas, Texas. Computer Room Top ViewRedundant network of cabling and water-cooling systems is placed on top of each computer room. This provides a better heat-control and racks management. Modular DivisionInside view of the modular units in our Frankfurt facility. Additional isolation available on each module in the datacenter for better protection. Network CoreThis is one of the redundant network cores used in the Chicago facility to provide network connectivity to all servers throughout the datacenter. Racks IsolationFront view of the server cabinets in our facility in London, UK. Each cabinet is isolated for additional protection of the servers. Server CabinetsAll cabinets in Singapore are placed in Cold Aisle Enclosures with network cabling run along the top of the enclosure. Constant MonitoringData analysis and constant monitoring in our datacenter in Chicago. This is important so we can make sure that all issues are addressed before they even appear.